The other week I introduced two new friends of mine, Thang and Kev, a pair of rainbow lorikeets who were then newly resident here at Glenview Street (aka Glenview Zoo). A few weeks on and I'd like to think that I'm now a firm favourite friend of theirs, a choice destination, for their visits are increasing in number and their volubility is escalating daily. They tell me all sorts of gossip these days and aren't adverse to pecking me "right proper" if I'm either not listening carefully enough or distributing sunflower seeds with the rapidity required to satisfy their ravenous appetites (which I kindly put down to the inclement weather and the intensifying cold). Occasionally there are little arguments with some other friends of theirs who pop in for a quick visit, but we soon get rid of them with some excuse or other and settle down again to our cosy circle. And at night, when Kev and Thang are fast asleep in the branches of some distant eucalypt, heads tucked under bejewelled wing, Pam the rat appears on the verandah to nibble away at their leftovers. She's very good at tidying up. When I was about eleven years old I came to Australia with my family to live in Melbourne for some months whilst my father was on an exchange visit with a university there. 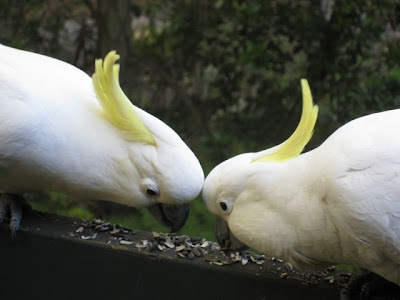 We took a house in a suburb called Heidelberg, as unlike the German equivalent as it is possible to be, and in the garden, a quixotic addition, was a caged Sulphur-Crested Cockatoo, called, um, Cocky. At the time I was obsessed with birds but I strangely don't remember much about him. This morning, up close and personal with Sarah and Michael, I began to remember. These cockatoos are very solidly built. 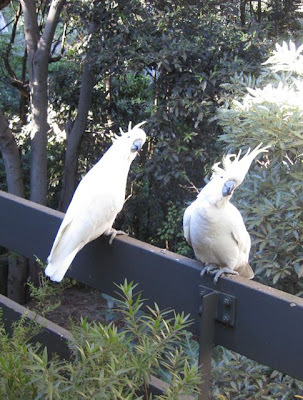 They strut and preen and look muscular - the Tysons of the bird world. 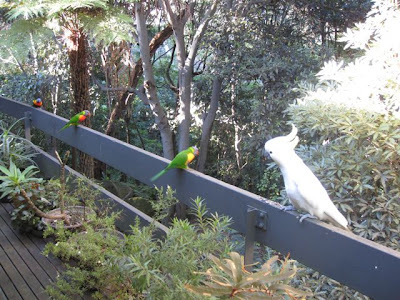 They are obviously, like all large parrots and cockatoos, extremely bright. 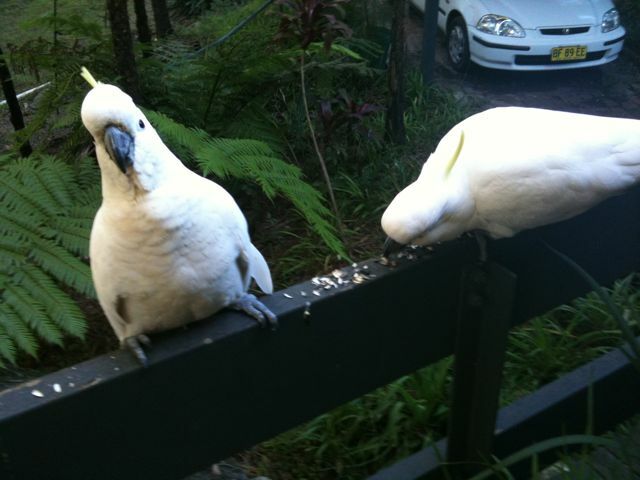 I can hear Australians in their hundreds saying: "Oh, you shouldn't feed them. They become a nuisance. They ruin your woodwork. Blah, blah." But for me, their visit this morning was simply out of this world. The caged cockatoo came with the house, as did its name. We were all unhappy about a cockatoo in a cage in a garden, but it was on the inventory. After we'd left Melbourne we were pleased to hear that Cocky's persistent pecking at the combination lock on his cage paid off and he fled. Perhaps he is Michael now. By the way, Mrs C and I wonder if you are losing any of your friends. Oi! Blondie, Get orf our laaand!